We landed in Paraguay in the afternoon, it’s very hot and humid! 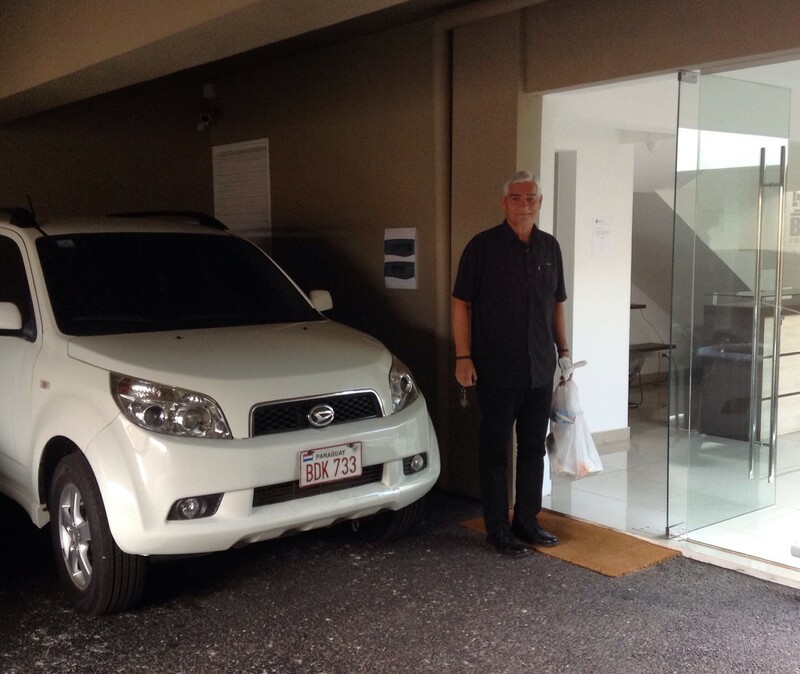 The Transformation Paraguay team have rented us a small apartment and gave us a cute little Toyotoshi car to drive – we are blessed! Our apartment doesn’t have a stove (just a hot plate) but does have a bidet! A trailer size fridge and a washing machine with line and clothes pegs to dry on the balcony. There are beautiful built-in closets, a queen size bed, TV, wi-fi, and air conditioning! What more could we ask for? 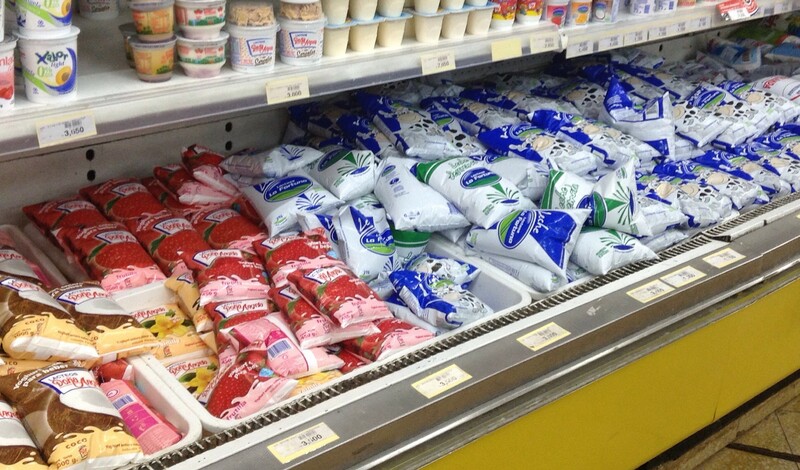 Grocery shopping within walking distance – everything you can think of comes in a bag! The language is presenting a bit of a struggle, there is an accent, they talk really fast and they use different words than my Mexican Spanish. There are two official languages here, Spanish and Guarani – maybe that’s why there are these mysterious words that pop up. I guess it would be like someone learning English in Canada and then going to Australia. Here the greeting is a kiss on both cheeks, even when meeting for the first time, and you do the kisses when you come and when you go, even if that’s only a few minutes. We see people everywhere carrying around a large thermos covered in beautiful leather or personalized in some elaborate way and a small cup attached to one side with a silver straw that has a filter on the end. 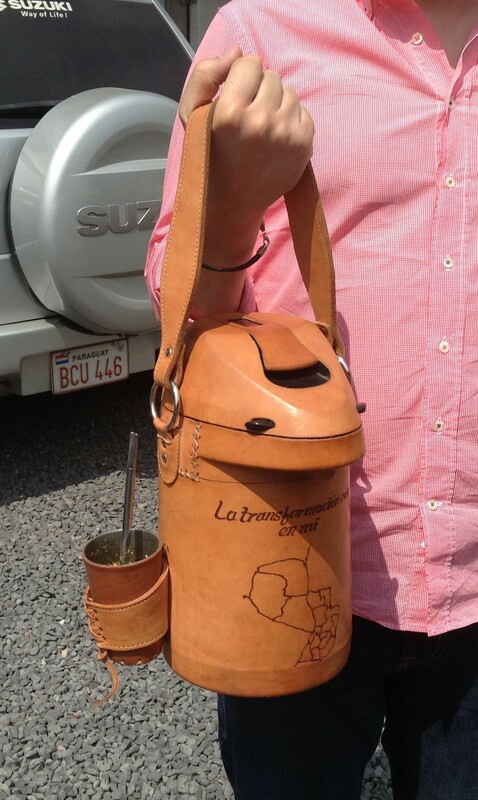 This is tereré, the social drink of Paraguay. 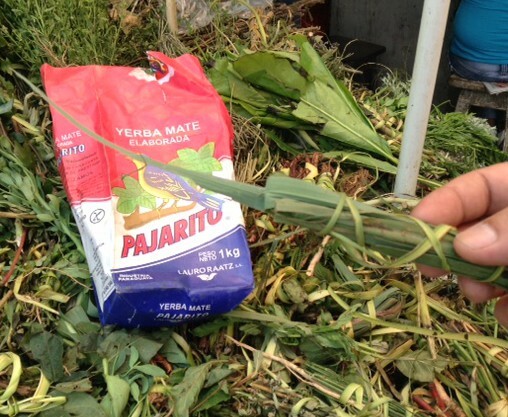 If you drink the dried yerba mate leaves hot – it’s mate , but because it’s so hot here they drink it ice-cold (hence the thermos) and it’s called tereré, the term for the whole get up and process of drinking this tea – which is adding small amounts of water at a time, and sipping on it all day. Medicinal herbs are infused as well as lemon and mint flavours. Paraguay is a small country of only 6.8million people. Asunción, the capital is one of the oldest cities on the continent, founded in 1537. There are a lot of old buildings, some half torn down or half built? Then tucked away here and there are lovely restaurants, sport clubs, houses and businesses of all kinds. Asunción is not that big, we are only 10 min. from downtown and there aren’t many tall high rises. No highways, just main roads and lots of side streets, many that are old and bumpy cobblestone. Traffic is crazy, just outside our hotel is a busy street with no light to get on to it, no centre lines and cars going every which way. They seem to park wherever, we’re driving along and then there are a line of parked cars making it a single lane, and this switches from side to side. Driving is an exercise in bravery! Mike maneuvers it all very well, all that Mexican driving training comes in handy!